It's that time of the week again, but this time... Here Be Monsters. This new Warzone is filled with freaky freaks and creepy creatures. It's the first warzone to have permanent night time, the perfect conditions to spawn monsters from your worst nightmares. With this new world comes 300 more player slots, a brand new set of islands to explore, and 4 new outposts to find. To help offset the darkness, you'll have Night Vision when inside PVP-free areas. (Spawn, outposts, and the market.) Be careful of what lurks in the shadows. 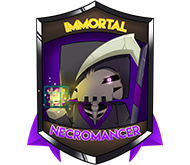 Our new custom enchantment comes with the new Vampire Immortal Kit, as well as being discoverable from warzone Sky Chests and Ancient Runes. Bloodsuck has a higher chance at causing your target to bleed, but with an additional perk: Each time BLEED damages your target, you'll be healed for what they were hurt. Bloodsuck offers a 3% chance per level to trigger. You also have the added perk of not burning in daylight, so that's cool too. Speaking of Immortal Kits... the Necromancer /ikit is leaving our store on Sunday. If you want it, make sure to pick it up before then! Who knows when it'll be back! The Executioner Kit is no longer buyable from the shop as of December 7th! THE EXECUTIONER KIT IS VANISHING WEDNESDAY! 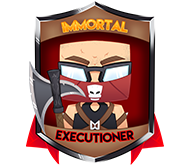 The Executioner Immortal Kit will no longer be for sale in the shop starting Wednesday, December 7th! Players who have already unlocked this kit will still keep it forever, but new purchases of it will no longer be possible. I have it unlocked! Do I still keep it? Yes! You have this immortal kit forever on the server you unlocked it on. I have an Immortal Shard for this kit! Will it still work? Yes! Immortal Shards for this kit will continue to work. 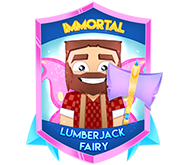 But buying new Immortal Shards for this kit will no longer be available after Wednesday. Immortal Kits are temporary, and will never stay around very long. It's important to unlock them before they vanish for good! The next immortal kit to vanish after this will be Necromancer. The date for this to disappear will be announced soon. GOING ONCE! GOING TWICE! 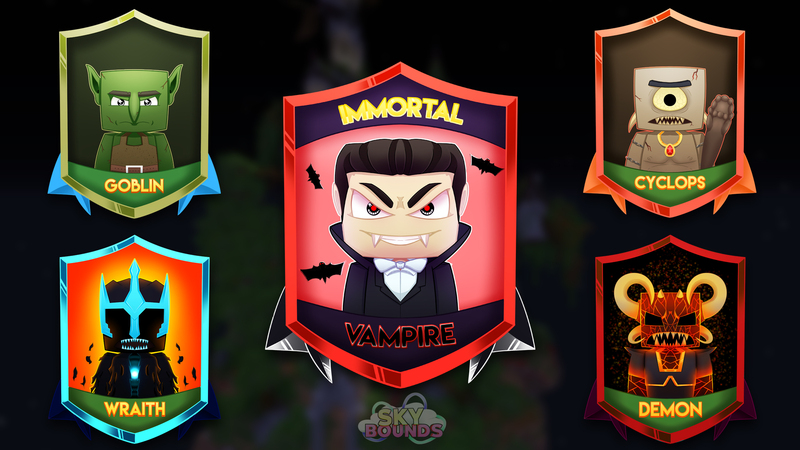 SOLD... TO SKYBOUNDS! The Auction House is a new way to buy and sell items on the Skybounds server. It's entirely run by players (from pricing to time limits!) Visit the auction house by speaking to the Auctioneer in the Marketplace of both Skybounds servers. You can also interact with the Auction House by using /ah anywhere you're in a PVP-free area. When you view the auction house (/ah v, for short), you'll see a list of all items currently listed by players. Across the bottom you can sort the listings by All Auctions, Auctions I'm Winning, and Auctions I've Posted. Left Click any item to view details about it (quick bidding, custom bidding, and buying it now.) Right Click any item to quick-bid on it for the price shown. Auctions ending first will be shown first! To list an item for auction, use /ah sell <Starting BId> [Time] [Buy It Now] while holding the item you'd list to sell. <Starting Bid> is the price the bidding starts at. Type 1000 to require the first bid to be at least that. All bids are in minimum increments of 25 stars. [Time] is optional. If you leave this out, your auction will end after 3 minutes. Legend+ players can list their auctions for up to 1 hour, while everyone else can list for up to 10 minutes. [Buy it Now] is also optional. If left out, people MUST bid on the item to win it. If specified, someone can pay the buy price to get the item instantly, ending the auction right away.